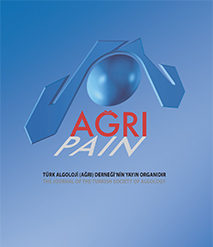 AGRI is a double blind peer reviewed journal published by the Turkish Society of Algology.This journal, which is published quarterly, is the official publicalion of Turkish Society of Algology, Reviews, details of interentional techniques, original researehes and case reports on the nature, mechanisms and treatment of pain are published. The journal provides a forum for the dissemination of research in the basic and clinical sciences of multidisciplinary interest.Opinions presented in published articles by no means represent the official endorsement of the Turkish Society of Algology. Articles and illustrations become the property of the Journal after publication. Each submission will be reviewed by at least two external, independent peer reviewers who are experts in their fields in order to ensure an unbiased evaluation process. The editorial board will invite an external and independent reviewer to manage the evaluation processes of manuscripts submitted by editors or by the editorial board members of the journal. The Editor in Chief is the final authority in the decision-making process for all submissions.